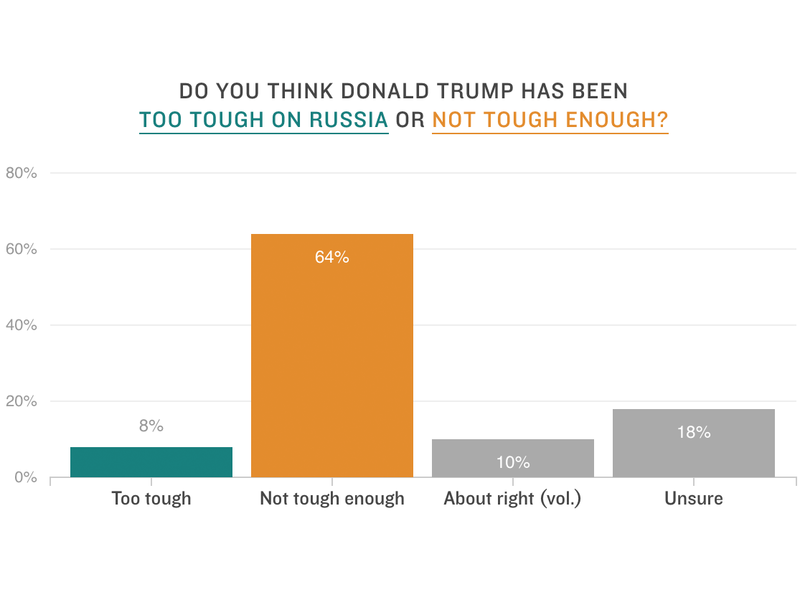 As to whether Trump should view Putin as a friend or foe, Americans are nearly evenly split, with 45 percent saying he should be seen as an enemy and 44 percent saying he is an ally. That might be a surprise to those who grew up in the Cold War era, but partisanship might have something to do with it. Among GOP voters, 58 percent view the Russian leader as an ally. A majority of adults overall (59 percent) do think it's better for the U.S. to build relationships with Russia, while less than a third say the country should be treated as a threat. Still, half of Democrats think Russia should be treated as a threat, while more than three-quarters of Republicans say the U.S. should build relationships with the country. That happens to be Trump's position. Americans overwhelmingly believe that Russia did seek to interfere in the 2016 elections — despite flip-flops from Trump as to whether he believes that to be true. Sixty-nine percent said they believe there was Russian interference in the 2016 election. That includes just over half of Republicans. A majority (57 percent) also believes that Russia is likely to try to interfere in November's midterm elections — something that intelligence chiefs have warned about but that Trump has downplayed. Most Republicans, however, side with Trump here, with 58 percent saying it's not very likely or not likely at all. But a whopping 72 percent of Americans said they have faith in the CIA's and FBI's conclusions about the assessment of the Russian election interference, compared with just 15 percent who believe Putin's denials. Trump has said Putin strongly denies any involvement. Eighty-six percent of Democrats say they believe the intelligence community over Putin, and 63 percent of GOP voters say the same thing. However, 21 percent of Republicans do say they believe Putin's dismissals. What is more, a majority of Americans believe that Russian interference in 2016 impacted the election, though just 37 percent said they believe it changed the outcome. Another 26 percent said it impacted the election but not enough to change the result, and 30 percent said it had no impact at all. Almost half of the country (46 percent) thinks that Justice Department special counsel Robert Mueller's investigation into Russian interference in 2016 has been fair, with roughly a third disagreeing. Those opinions are, unsurprisingly, deeply split along partisan lines — 62 percent of Democrats say it has been fair, while half of Republicans say it has been unfair. More than two-thirds believe Mueller should be allowed to finish his investigation though, including 60 percent of Republicans. Less than a quarter of GOP voters say Mueller should be fired. But Republicans view the FBI, which Trump has repeatedly demonized, differently than the public at large does. Almost 6 in 10 people say that the FBI is just trying to do its job, while one-third of Americans say it is biased against the Trump administration. Fifty-five percent of Republicans think the FBI is biased against the president, compared with 85 percent of Democrats who say the law enforcement agency is just doing its job. Most Americans don't believe that Trump has done something illegal in regards to his dealings with Russia and Putin. But just over a quarter think that he at least did something unethical. Those views, too, change along partisan lines. Democrats are poised for gains in the midterm elections, buoyed by big advantages among women and with voter enthusiasm on their side. When registered voters were asked which party's candidate they're likely to vote for come November, they favored Democrats over the GOP, 47 percent to 40 percent. That 7-point advantage is up from a 5-point edge in an NPR/PBS NewsHour/Marist survey in April. Female voters say they prefer Democrats this fall by a 21-point margin, 54 percent to 33 percent. Republicans win men by 9 points, 48 percent to 39 percent. Negative opinions of Trump are pronounced among women. Trump's job approval has remained relatively static — still underwater at 39 percent approval to 51 percent disapproval among all Americans. But there is a staggering 43-point gender gap with 62 percent of women disapproving of Trump's job and half of men approving of his performance. Fifty-seven percent of suburban women also strongly disapprove of Trump, and Democrats have a 28-point edge in which party suburban women would vote for in November. This is an ominous sign for Republicans given that these will be critical voters in many House battlefields. "You would be hard-pressed to find a president who has more sharply divided the nation along gender lines," said Lee Miringoff, director of The Marist College Institute for Public Opinion. "It remains to be seen what role this may play in the midterm elections, the 2020 presidential election, and political party affiliation going forward." Among the party base, though, Trump is stronger than ever — 62 percent of Republicans strongly approve of the job he is doing, leading to overall, 25 percent of Americans strongly approving of his job, his highest mark in the poll. Still, that doesn't erase the hotly negative views of him with 44 percent overall strongly disapproving of his job. Trump's favorability rating has improved over the past three months, up 4 points to 41 percent. That's largely due to the 88 percent of Republicans who are still firmly in his court — something the GOP hopes translates to enthusiasm at the ballot box come November. But there are other signs of greater Democratic engagement — 78 percent of Democrats say the midterm elections are very important, while 68 percent of Republicans say the same thing. And women, again, appear to be more fired up, with 72 percent saying their vote this November is very important. A plurality of voters (46 percent) also say Trump has made them more likely to cast a vote for Democrats this fall, compared with 37 percent who say he has made them more likely to vote for the GOP candidate. Among women, 56 percent say Trump is pushing them toward the Democratic choice. Part of that is because of Trump's personal attributes. A majority of Americans think Trump is untruthful — 61 percent say he only tells the truth some of the time, hardly ever or never, while 36 percent think he is truthful almost all or most of the time. Fifty-six percent also say he tells the truth less often than past presidents. Americans also say they're dissatisfied with Trump's approach to foreign policy, his conduct abroad and his positions on immigration. By a nearly 2-to-1 margin, Americans say Trump's conduct as president makes them feel embarrassed. Among Republicans, though, 70 percent say he has made them proud, and 91 percent of Democrats feeling embarrassed. Almost half (46 percent) say his actions during the NATO meeting earlier this month hurt U.S. relationships with European allies, while just 19 percent say they helped. Forty-seven percent also say he is changing U.S. foreign policy for the worse, while 37 percent say it's going in a better direction. Nearly half of registered voters (48 percent) also say he is changing immigration policy for the worse, while 40 percent say he is improving it. Those numbers come in the wake of the administration's controversial move to separate children from their parents if detained at the border. The administration has reversed its position but has struggled to reunite children with their families. Trump does still have an advantage on the economy, though. That is another thing Republicans hope will be their key to holding onto power in Congress. Just over half of registered voters — the most since Trump was inaugurated — say he is moving the economy in a better direction with about a third saying he is making it worse. By an 18-point margin, half of independent voters also think Trump has improved the economy. Voters are evenly split on Trump's trade policy, however — 46 percent say they disapprove of his recent tariffs on imports and foreign-made goods, while 44 percent approve. But despite the party's long history of supporting free trade and the tariffs already hurting the agriculture sector, more than three-quarters of Republicans approve of Trump's decision to levy tariffs. The White House announced Tuesday that it will provide $12 billion in government assistance to farmers hurt by the escalating trade war. With all of that, confidence in major democratic institutions is waning. Only a quarter say they have faith in Congress and the media, while a third have faith in the Democratic Party and even less in the GOP. Just 43 percent say they trust the presidency. The military fares the best, with 88 percent saying they have confidence in it. A majority say they have trust in the Supreme Court and the FBI.